The second key we study in music theory after the key of C is the key of G. Unlike C, where we have all natural notes, we have one sharp in G that is the F#. And because it has only one sharp, this is the key that we cover after the key of C. A good way to remember this is to take reference from the circle of 5th. But since that hasn’t been discussed yet, a mnemonics can help to remember the fact that in the key of G, we replace F with F#. The other easy way to remember is that the note that comes right before G, which is F is the one that needs to get replaced by F#. Therefore, the notes we have in G are G A B C D E F#. And just like all other major keys, G also follow the same order of chords. 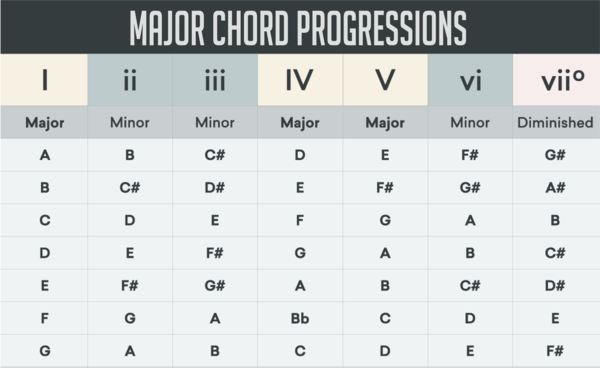 Remember which chords are major chords in a major key? What about the diminished? And what about the related minor of G major? That should be the 6th degree of the key of G, and that is……………………………………………..E minor. Following are some of the popular progressions used in numerous songs. It’s a good practice to memorise these progressions at all times. 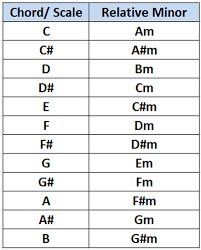 Also note that these chords can be played in any order and doesn’t necessarily have to be how they are written here. Try making different combinations and explore the different sounds you can create using these chords. The three notes that create the distinction between Major (Ionian mode) and Natural Minor (Aeolian mode) scales are 3rd 6th and 7th. One easy way to remember this is that on MAJOR, as the name suggests, we have all the larger intervals. Whereas in minor, those 3 notes get flattened, resulting in shorter intervals, hence called MINOR. However there is a relation between a Major and Minor scales as every Major key has a related minor and vice versa. Looking at it from the perspective of a major key, the 6th degree of the Major key is its related minor. So again going back to the key of C, the 6th degree is A minor, therefore A minor is the related minor of C major. What it means is that both C major and A minor scales share the same identical notes. The difference however is in the voicing as in C major, the tonal centre or root is that C note (C D E F G A B) and in A minor scale the tonal centre or root is the A note (A B C D E F G). If you look at this from the minor key then it is the third degree of the minor key that represents the related major key. In the key of A minor, the third is C, which is the related major of A minor key. Playing guitar is mentally, as well as physically quite challenging. A guitar player needs to look after both her/his hands. The idea is to keep it loose and economise the movements on both hands. The more effort and energy it take to play something, the sloppier it’s going to sound and more susceptible to injuries. Repetitive stain injury (RSI) and tendinitis are not very common, but both are possibilities for performing guitarists or anyone who practices for long hours. If your work is physically challenging and puts a lot of strain on the hands, require a lot of grip strength, you need to take extra care of your hands. Make sure to properly warm up, stretch and provide adequate rest between the practice sessions. I used to box when I was a teenager and at one point realised, I can’t do both guitar and boxing. Injuries and pain on the hand from boxing hindered my guitar practice immensely. I had to pick between being a no name boxer or somewhat of an accomplished musician and the choice was very easy for me. The following video provides some of the stretching exercises I do before and during a practice/performance. Notice how the stretches and hand exercises are slightly different for the strumming hand. Make sure to perform these if you are practising for long hours and preferably before each practice session. Intro: A good intro catches a person’s attention. It is often instrumental with a slower tempo than the rest of the song. Verse: The verses build up the tension of the song and fill in details of the song’s message or story. One or more verses usually precede the chorus. Typical rock songs have two or three verses, which sound alike, but have different words. Refrain: The refrain is a line that is repeated at the end of each verse. Pre-chorus: The pre-chorus is optional. It ramps the song up for the chorus. A pre-chorus may contain a chord progression from either the verse or the chorus. Chorus: The chorus contains the hook, or most memorable part of the song. It is usually the most simple part of the song and contains the song’s central message or theme and offers a solution or relieves tension that builds in the verses. Generally speaking, the chorus is repeated at least once. Bridge: An optional transition, the bridge happens once, replacing one of the verses in the verse-chorus form. It may introduce a new musical theme and often happens near the end, between the second and third chorus. It can be an instrumental break with no lyrics. Solo: A single performer’s part comes to the forefront and the rest of the band will drop out or play softer. Sometimes it is included as part of the bridge. Breakdown: A breakdown adds dynamic range to a song. It can be the same as the verse or chorus, but with less instrumentation. Sometimes the breakdown is used to turn down the energy level of a song, just before it is boosted way up. Extro (or Coda): This final part of the song is often an instrumental version of the hook. Sometimes it is slowed down or the final chord is held. Forever is from Ben Harper’s debut album, Welcome to the Cruel World. This undoubtedly is one of his most popular songs. The song is written in the key of Am, creates the melancholic vibe perfect for this song. The iconic guitar intro of More than words by Extreme, written in the key of G (guitar tuned down to D#) is another beautiful song to play on acoustic guitar. Written in a major key but uses some chords outside the box (i.e. minor plagal) makes it a beautiful song to study. Say you won’t let you go is another of my favourite song to play on acoustic guitar. Written in the key of A#, played in G with a capo on 3rd. That same chord progression is played for the whole song but the simplicity of the plucking makes it such a catchy one to listen to. Tears in heaven, written in A major has such a rich chord progression and exotic baseline. I always prefer playing this piece without using a metronome of some sort. The controlled variation of tempo gives such a nice human touch to this amazing piece of music. Try playing this without using a uniform tempo and play around with the dynamics of your strum. Really makes it sound a lot better. Lastly, shape of my heart, written in the key of F# minor uses a ton of exotic chords, beautiful progression and some intelligent but subtle variations in the melody. There are tons of different ways to play this song and there are many different versions out there. But I tried to keep and as close as possible to the original studio version. Guitar used here is Maton EBG808 Tommy Emmanuel signature series. This whole thing is recorded using GarageBand on ipad pro 10.5. The guitar is connected through Focusrite itrack solo. For people who would like to get their hands on a guitar, they must first learn the guitar lingo. The guitar lingo is made up of weird-sounding words that are unique to the guitar world. The guitar lingo also applies to the guitar parts. You must be able to know the parts of a guitar to be able to know how to play it. This is also referred to as the sound box. This is the largest guitar part and it comes in different shapes and sizes. The acoustic guitars usually have a hollow body, while electric guitars have solid or semi-solid bodies. Acoustic guitars have hollow bodies because they rely on the body structure for sound resonation. Electric guitars use electronic pick-ups to amplify the sound. The headstock is the part at the end of the guitar which holds the tuning keys. It is connected to the neck of the guitar. The nut is the piece between the guitar neck and the head. It is a small rod with indentations to hold the guitar strings in place. The neck is the long section which holds the fret board. The fret board is divided into different notes by small metal rods. The number of frets in a fret board varies depending on the type of guitar and the brand. Modern electric guitars usually have 20-22 frets in the fret board. It is a part of the guitar’s body and it is important in sound resonance. It gives some sort of elevation for the guitar strings so they can produce nice vibrations. The pick-up is an electronic device which acts like a microphone. It picks up the vibrations from the strings and converts these vibrations into electrical impulses. The amplifier is like a speaker box where the sounds of the electric guitar come off. This is a device which is attached to the fret board. This thing allows a player to play the same chord structures but on a different key. Guitar riffs pertain to musical pieces which are parts of a song. It is added to the sound of the guitar through an effects box or through amplifiers to make the sounds a little bit more natural. Guitar tablatures or more commonly known as guitar tabs are written music for guitars. It is similar to musical pieces (with notes and other musical symbols) but the notes are translated into guitar frets. It’s a useful tool in learning how to play the guitar. It refers to a guitar technique where the string is slightly bended in a fast rate to make a longer resonating sound. This refers to a technique where one takes out notes from a specific chord. He can then use these to make an adlib lead technique or add to the rhythm of the song. This is the small device which guitar players use in striking the guitar strings. It is usually made of plastic. It’s a picking technique where a player does not strum the strings all at one but hit the strings one by one to be able to get a softer and more defined tone. This is a technique where a player uses his picking hand (usually the right hand) to mute the strings while strumming to be able to get a distinct tone. It is very popular in the punk rock world. The world of guitars is composed of many other new words. One must be able to master these or at least have an idea of what these are to be able to appreciate the wonderful instrument that is the guitar. The guitar has been one of the most popular musical instruments today. Most of the kinds of music that one hears from the radio use guitars in many ways. Pop, rock, reggae, blues, ballads and everything else is influenced by the guitar. The guitar, together with the drums and the piano compose the modern music scene equipment set. The playability of the guitar has made it one popular instrument. A guitar can be played by a learning child or an experienced guitar player. It’s not picky with its players. Today, the electric type of guitar is mostly used in musical production. The guitar has gotten a very good accompaniment in the form of the effects box. Today, guitars can emulate the sounds of a piano, a violin, even the sounds of the human voice. The guitar is continuously widening its horizons. With the functions and features of the modern electric guitar, one can’t help thinking about the beginnings of the instrument. Where did the guitar come from? This article tries to give a brief history of the wonderful musical instrument, which is the guitar. The creation of the guitar cannot be traced to a single person. The guitar came about through the evolution of its predecessors. Its image has also undergone change throughout the centuries. Today, playing the guitar is a symbol of talent and musical prowess, but during the early times, the guitar was actually a symbol of being poor and it was refuted by most classical musicians. There have been many guitar-like musical instruments in the ancient times, up to at least 5,000 years ago. Instruments which look like the guitar were seen in statues which were recovered in archeological expeditions in the Iranian region of Susa. However, the very first documented mention of the instrument dates back to the fourteenth century. Back then, the said guitar-ancestor had three pairs of strings (usually referred to as double courses) and a single string with the highest tone. Some say that the word “guitar” came from the word “qitara.” Qitara is an Arabic name for the different kinds of lutes during the early times. The guitar, as we know it, is said to originate in Spain. It is believed that the people of Malaga invented the instrument. The guitar evolved from having three pairs of strings to four pairs of strings and eventually six single strings. The guitar began to become popular in the 16th century. It was played by the lower and middle classes as a counterpart for the vihuela which was played by the aristocrats. The vihuela was tuned like a lute but had a body similar to that of the guitar. of the body of the guitar. The guitar still struggled during these times because it was considered as an instrument for the taverns – an instrument which cannot be used for classical music. In Spain, where people hated the piano, the guitar found refuge. However, it was also tainted with views that guitars are for undesirables. The modern electric guitar was born in 1931. The electric guitar uses electronic “pick-ups” to be able to produce sound. The pick-ups convert the vibrations from the strings into electric signals. The body of the electric guitar is semi-solid or solid, depending on the design. The structure of the guitar took a great leap when the electric guitar was born, no longer did its sound depend on the structure and construction of the body, but on the quality of the pick-ups and soundboard. The sounds of the electric guitar can also be altered to be able to achieve a desire tone. The use of guitar effects box has given the guitar a wide array of sounds. The electric guitar is continuously garnering popularity in all fields of music, even in classical music. The guitar is a very dynamic musical instrument. Through evolution, the guitar has made its mark on the modern music scene. From crude instruments with many variations, the guitar has become a real and much-sought after instrument. What are the different kinds of guitars? If one wants go get into the guitar world, you can start learning with an acoustic guitar. Acoustic guitars are dependent on their structures and body shapes in resonating sounds. Unlike the more modern electric guitars, they don’t rely on other external devices in making sounds. The natural vibrations of the strings are resonated by the body of the guitar. Classical guitars are very popular. They are usually the choice guitar for beginners. The strings are usually made from nylon. These are usually played in a standard sitting position and used in playing classical music. Classical guitars produce think and whole sounds which are very warm to the ears. Flamenco guitars are almost similar to the classical guitars; however, these guitars produce crisper and thinner sounds than the classical ones. Steel-top guitars are much similar to the classical guitar. These, however, are constructed to be more resilient. The parts of the steel-top guitar are reinforced and their bodies are significantly larger than the classical guitars. They produce a warmer tone than the classical guitar. A normal guitar usually has 6 strings, but the 12-string guitar, as its name implies, has 12 strings. Each string is accompanied by another string with the same note but is usually tuned in a higher octave. This kind of guitar produces a semi-chorus effect which is very pleasant to the ears. This type of guitar is similar to the steel-top guitar, but the steel in the middle of the soundboard is used to resonate the sound from the vibration of the guitar strings. This produces a very thin and distinct sound. These guitars are usually used in playing the blues. There are also variations of the resonator guitar; the square-neck resonator guitar is played on the lap like a piano or organ. The round neck resonator guitar is played like a common guitar. Resonator guitars work very well with glass or metal slides. The archtop guitar is inspired by other instruments such as the violin and the cello. An archtop guitar usually has the f-hole design. Jazz players prefer archtop guitars. Some archtop guitars can reach prices of about $25,000 USD. Acoustic bass guitars are bass guitars without electronic pick-ups. The body of the guitar is used to produce the sounds. These are usually 4-stringed guitars but there are acoustic bass guitars which have 5 or 6 strings. Electric guitars make use of electronic pick-ups to amplify the vibrations of the guitar strings. They are usually connected to electric amplifiers. Electric guitars usually have a solid or semi-solid body type. They don’t use the body for sound resonance and thus, they usually make very little or no sound when played without an amplifier. The concept used by electric guitars is- the energy of the strings are diverted into electrical impulses are not directly into sound to be able to achieve an amplified sound. Electric guitars usually have control knobs for changing the volume or the tone of the guitar. There are also pick-up selectors in electric guitars. Many electric guitars use multiple pick-ups to achieve the best guitar sounds. These pick-ups gather and produce different tones from the guitar. The tone knobs are usually used to shift from a bass-intensive sound to a treble-intensive sound or vice versa. Some electric guitars also have whammy bars. 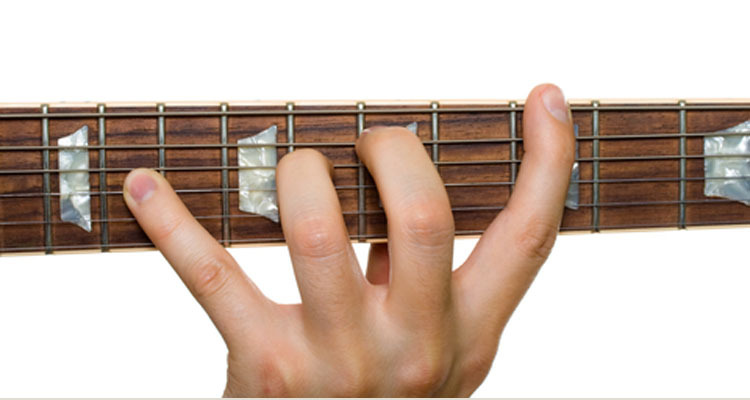 These bars are attached to the guitar to shift notes without changing the finger positions in the fret board. Whammy bars are used to produce “crying” guitar sounds. This is a very useful tool in doing rock and roll songs or even ballads. The use of the whammy bar in less expensive guitars is not advised because it may cause the strings to go out of tune. These are some of the basic types of guitars that are available out there for everyone.